Underwater sculptor Jason deCaires Taylor who has created large underwater sculpture gardens in the waters of Grenada and Mexico has just launched a project in the waters of the Canary Islands that acknowledges the plight of boat people. 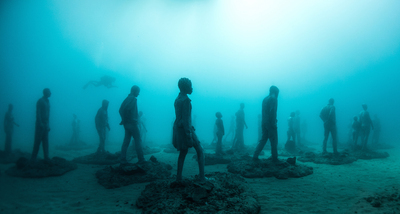 Underwater sculptor Jason deCaires Taylor just got serious. 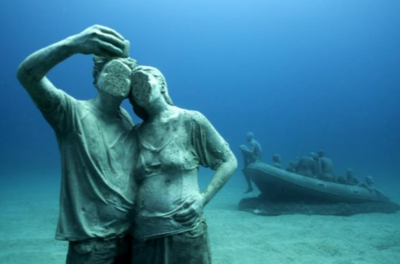 The British diving artist who has created large underwater sculpture gardens in the waters of Grenada and Mexico has just launched a project in the waters of the Canary Islands that acknowledges the plight of boat people. 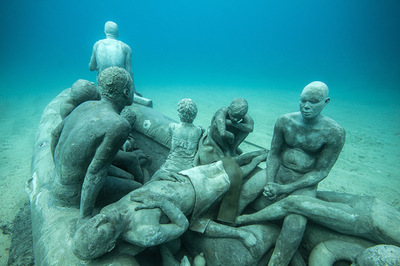 While his Caribbean sunken galleries have tended to be playful, sometimes religious, the newest project of the 41-year old, skewers important world issues from climate change to conservation to migration. Taylor says that the main installation, The Rubicon "features a group of 35 people walking towards a gate, a point of no return or a portal to another world." 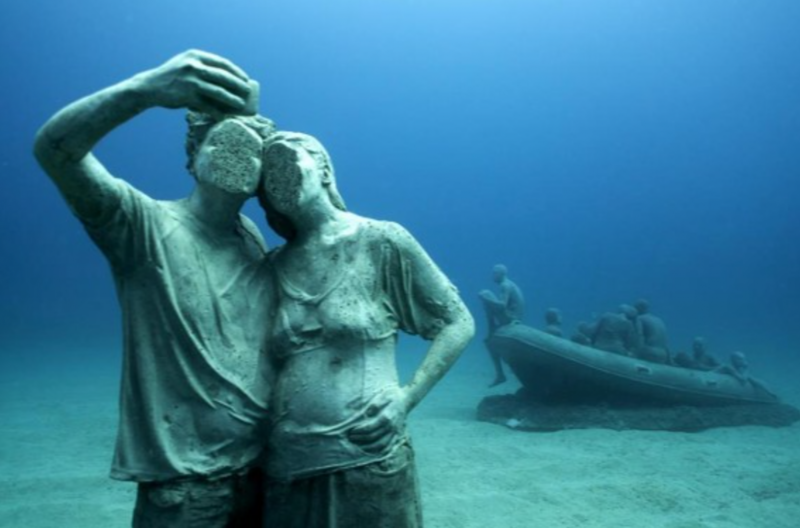 Two months ago he opened the first phase of Museo Atlantico -- an art project he describes as "the first underwater contemporary art museum in Europe and the Atlantic Ocean." There are 300 life-sized figures standing at bottom 14 metres down -- more are on the way. "It is still in construction, over 250 more works will be added in the coming year" the artist told me in March. "It will be complete in January 2017." 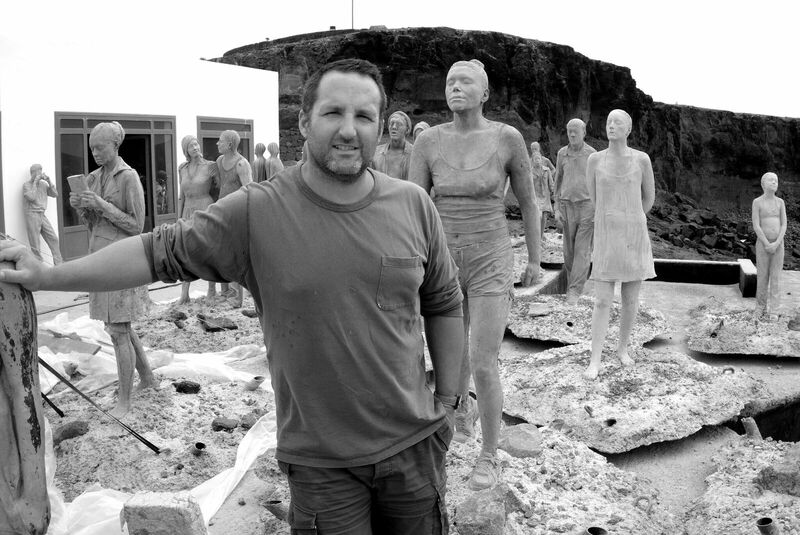 The non-polluting concrete statues are made from casts of real people. And while the models are living beings, the new inhabitants are not. According to the artist the Raft of Lampedusa is "a harrowing depiction of the ongoing humanitarian crisis, referencing French Romantic painter Théodore Géricault's work: The Raft of the Medusa. Drawing parallels between the abandonment suffered by sailors in his shipwreck scene and the current refugee crisis, the work is not intended as a tribute or memorial to the many lives lost but as a stark reminder of the collective responsibility of our now global community." There is a raft filled with escaping migrants who never will make it to land. The artist says he isn't eulogizing the dead, but rather shining a spotlight on their plight. And what of the tourists taking selfies as they appear to walk along the bottom? Taylor calls it the Rubicon where 35 people are walking towards a gate -- it is " a point of no return or a portal to another world." (Crossing the Rubicon references Julius Caesar who said in 49 BC that when you cross the Rubicon River you can't come back - it is the point of no return). The concrete is striated so that over time the pieces will be covered in plant life and schooling fish will live amongst the art pieces. "We never interfere with the natural development of the works," Taylor continued. "The museum is in a protected bay. Each piece is between one-10 tons, so I am not predicting major disturbance but with you can never be 100 per cent certain with the sea. Obviously the works won't change like it has in tropical areas (his installations in the Caribbean) but will still be colonized. Just after two weeks we have seen schools of juvenile fish, 2 angel sharks, several octopus and algae and calcium deposits on the pieces." The installation is a commission from the Spanish Government. The placement in the waters of Lanzarote is already boosting tourism and paying dividends. "It was officially opened today (March 2nd), several groups of divers from around Europe came over to be the first people top see the museum," Taylor told me. "And on return we were met on shore by the president of the Canary Islands." Lanzarote is known for its year-round warm weather, beaches and volcanic landscape. It is the third most populous island of the Canary Islands. "Not sure quite yet what I will do next. Think large and think deep. I have another underwater project in Bali soon and the possibility of some works in the Med but yes it seems I will be below the waves for some time."